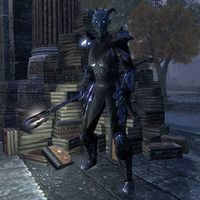 Daedra are immortal creatures from the planes of Oblivion. 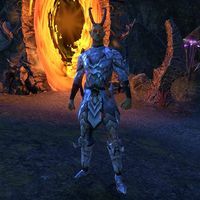 There are many variations, which can be categorized into two subtypes— Atronachs and Humanoids—along with other lesser daedra. 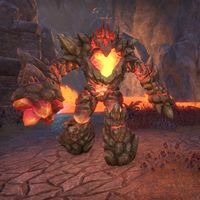 Air Atronachs are powerful air elementals found in Craglorn. They primarily use spinning blade attacks. 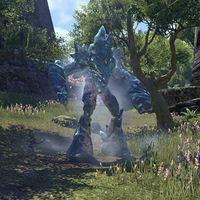 Following the atronach naming conventions, the air atronachs' typical name might begin with "Parel", although there is only one such air atronach found in ESO. Flame Atronachs are fiery and malevolent fire elementals. They use area of effect flame attacks, and explode upon death. 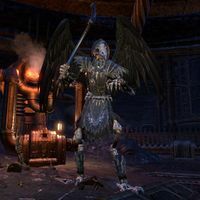 Cold-Flame Atronachs are found in the employ of Molag Bal. 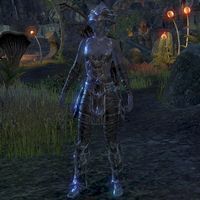 According to the naming convention in ESO, the flame atronach's unique name seem to begin with "Magdra" although there are only two such flame atronachs found in ESO. 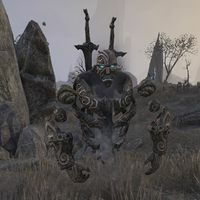 Flesh Atronachs are Daedra bound to dead flesh through necromantic ritual. 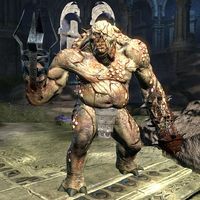 They are often summoned by necromancers and rely on melee attacks in combat. The unique flesh atronachs' names do not seem to follow any clearly defined rules. 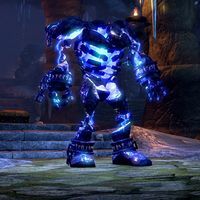 Frost Atronachs are large ice elementals. They can freeze opponents solid and have powerful melee attacks. Many frost atronach names begin with the word "Nomeg". Iron Atronachs are molten iron elementals. They can be found on Vvardenfell. Iron Atronach names begin with the word "Mynar". Storm Atronachs are large lightning elementals. They use area of effect shock attacks. 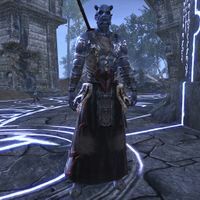 Several storm atronach names begin with the word "Zymel". Stone Atronachs are one-eyed, four-legged atronachs found in the Bloodroot Forge and Falkreath Hold. A unique Foundation Stone Atronach is found in the Aetherian Archive, made from the foundation stones of the tower. 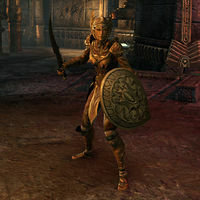 Aurorans are a golden-clad race of Daedra in service to Meridia. They are notably rare. 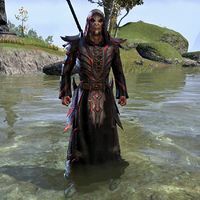 Dremora are a warlike race of Daedra most often associated with Mehrunes Dagon. Like most NPC enemy types, there are many different classes of Dremora and they are often found in complementary groups. 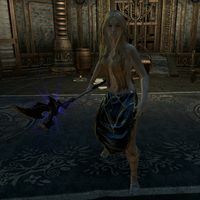 Dark Seducers are a purple-skinned and seductive race of Daedra associated with Sheogorath. Like most NPC enemy types, there are many different classes of Seducers and they are often found in complementary groups. 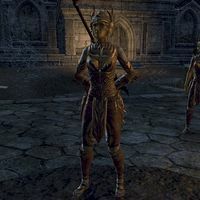 Golden Saints are a haughty, golden-skinned race of Daedra in service to Sheogorath. Like most NPC enemy types, there are many different classes of Saints and they are often found in complementary groups. Herne are a horned race of Daedra associated with Hircine and Mehrunes Dagon. Only one can be found in-game, and it is technically a renamed Skaafin. Huntsmen are a race of pale-skinned humanoid Daedra in service to Hircine. They wear animal skins and pelts fashioned into a form of armor and drop Daedra hearts. They are only encountered in The Hunting Grounds. Shrikes (also called Nocturnals or Nocturnal Shrikes) are a race of towering pale-skinned humanoid Daedra in service to Nocturnal. They have red eyes and resemble female humans, scantily-clad with long hair covering their breasts. They are often encountered in pairs. 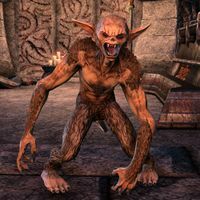 Skaafin are yellow-skinned, horned Daedra in the service of Clavicus Vile. They are primarily found in Vvardenfell and parts of the Clockwork City. Like most NPC enemy types, there are many different classes of Skaafin and they are often found in complementary groups. 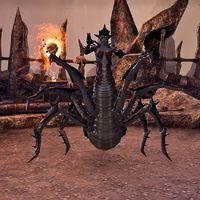 Spiderkith are navy-skinned Daedra in service to Mephala. Like most NPC enemy types, there are many different classes of Spiderkith and they are often found in complementary groups. Wraith-of-Crows are large winged creatures made up of multiple Daedric Crows. They resemble skeletons with a bird skull and wear a black cloak. Xivilai are tall, horned humanoids and proficient torturers. 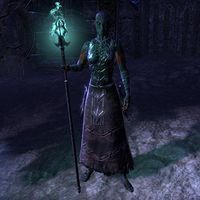 They use lighting attacks and can summon lesser Daedra to act as permanent familiars. 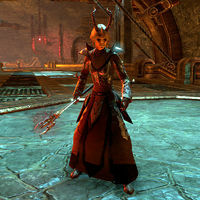 Xivkyn are powerful humanoid Daedra found in the Imperial City and at Dark Anchors. 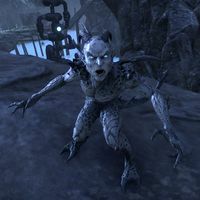 They are a fusion of Dremora and Xivilai, created by Molag Bal. 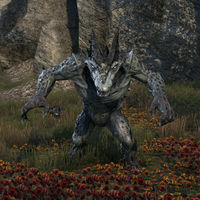 Banekin are small horned Daedra. They use lightning attacks and are often found in large groups. Clannfear are aggressive, quick Daedra. They have a small frill, plated spikes on their spines, and a deadly tri-tipped tail, and can charge enemies in combat. 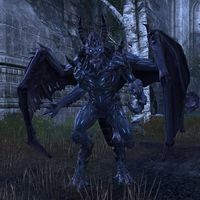 Daedric Titans are giant winged Daedra. They are very powerful, with a lot of health and fiery breath attacks. Daedrats are Daedric rodents found mainly in the Imperial Sewers. Although usually passive, they can be encountered as enemies. 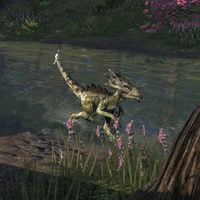 Daedroths are large crocodile-like Daedra. Fiendroth are passive creatures found in the Imperial Sewers. 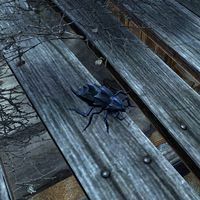 They are small, beetle-like Daedra. 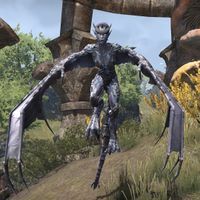 Grievous Twilights are powerful winged Daedra found in various locations. They have the ability to teleport. 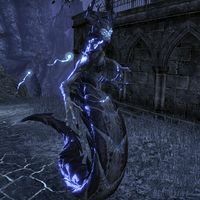 Harvesters are snake-like feminine Daedra. They can be a challenge to take down alone due to their restorative powers. 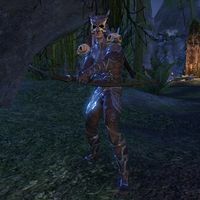 Hoarvor Daedra are a rare spiderlike Daedra. Kraohl the Defiler and Velidreth are the only ones in the game. 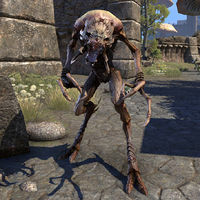 Hungers are a tall lanky insect-like Daedra. They have numerous pincers near their mouths, clawed hands and feet, and a sac behind their head which they can use to spray acid. 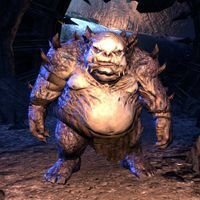 Ogrim are brutish Daedra often associated with Malacath. They rely on hand-to-hand combat, and have the ability to charge enemies and heal themselves. Scamps are weak, mischievous Daedra. 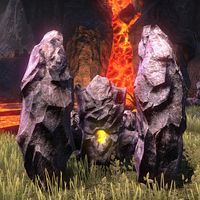 They can attack by launching fireballs from their hands and make fireballs rain from the sky, and will switch to normal melee attacks when you finally get close to them. 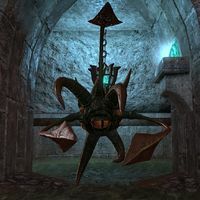 Spider Daedra are Daedra resembling a cross between a woman and a giant spider. They can summon a Spiderling to aid them in combat. Watchers are flying tentacled Daedra. They use knockback attacks and powerful lasers. Winged Twilights are flying Daedra usually associated with Azura. 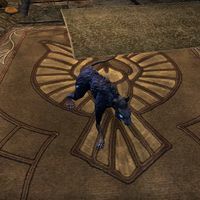 Larval Yaghra pets are also incorrect listed as Daedra in-game. This page was last modified on 3 March 2019, at 14:34.